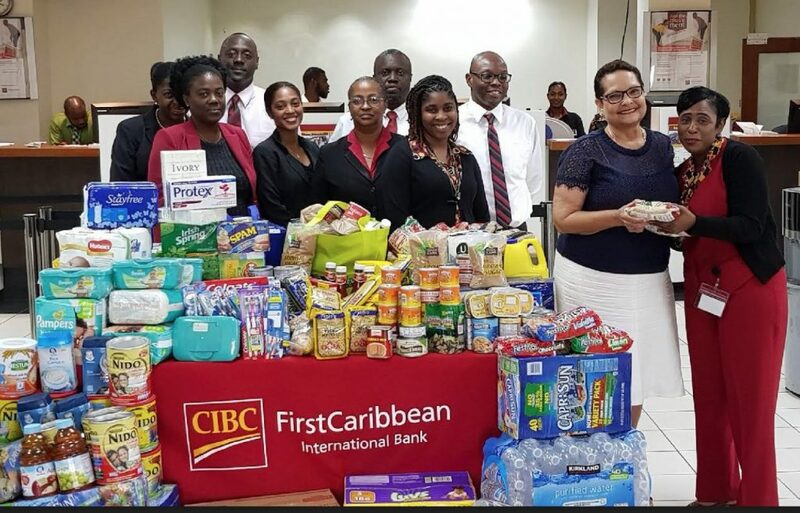 Staff of CIBC FirstCaribbean International Bank presented FSN President Mrs Judith Charles with non-perishable items collected in an internal drive to help restock the charity’s pantry. PRESS RELEASE: Staff of CIBC FirstCaribbean teamed up to help restock the Family Support Network (FSN) pantry this month. The internal pantry drive is an initiative embraced by employees of the bank who have pledged to support the FSN in deed and in kind. This month’s effort was a collection of non-perishable items and was presented at the end of May to Mrs Judith Charles, President of the FSN by staff at the bank. “We feel fortunate that we are in a position to support members of our community who struggle to make ends meet, especially after the category 5 hurricanes Irma and Maria,” said Mrs Juliet Fahie, Client Services Officer, Corporate Banking who assisted in the collection of goods. The collection focused primarily on children’s needs and personal health and included items such as diapers, baby wipes, powdered milk, lunchbox snacks and drinks, toothbrushes, toothpaste, soaps and daily food staples. In 2016 FSN’s new clients totalled 244 and the food pantry alone fed 2,631 people. New clients in 2017 totalled 418 with the ages ranging from 18 to 97. In the months after the 2017 hurricanes, the total number of persons in households fed from September to December was 1,064. For the year 2017, the total number of persons in households fed was 3,852. According to FSN reports, figures for 2018 are close to that number already. “We assisted 55 people who had been made homeless by the storms and 65 were homeless but being sheltered by friends. We had two retirees who came regularly for services such as the monthly food distribution. Now we have over 50 retirees requesting help. We provided food, water, and clothing to all these people,” said Mrs Charles. The work undertaken by the FSN goes beyond the provision of basic food and shelter. “After the hurricane, we had to repatriate a young woman to the Philippines with the kind help of a local business. We helped a retired lady with her cataract surgery by getting another organization to help with the cost. We helped an elderly gentleman get to the hospital and get his house back so that he could be returned there after his hospital stay, with the assistance of two other local nonprofits. We’ve delivered food parcels to the elderly, shared with the local home for the elderly, found help for one homeless family that consisted of two small children,” explained Mrs Charles. The scope of help required every day is wide and endless. 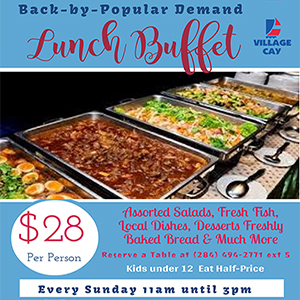 “There have been several closures as a result of the hurricanes, so there are many people on island who are currently out of work,” said Mrs Charles. Beneficiaries and donors can collect or drop off items at the FSN’s current location in the O’Neal Building (below Harney’s) on Main Street from 10am – 4pm, Mondays through Fridays. The FSN can be contacted at (284) 494-7622 or (284) 341-7693. In October 2017 CIBC FirstCaribbean was able to secure funds from the bank’s ComTrust Foundation to give the FSN a donation of $8000 as well as pallets of hurricane relief items such as drinking water, healthcare and cleaning products and practical items including tarpaulin, plywood, 3×4 wood, nails, rope, and jerry jugs. How do we contribute if we are in the US? I have tried several times to donate hurricane relief items and even money but nobody is interested or returns my messages. I even had a few individuals tell me that they didn’t want my help because I’m from America. Regardless I love the BVI and want to help my friends any way I can.